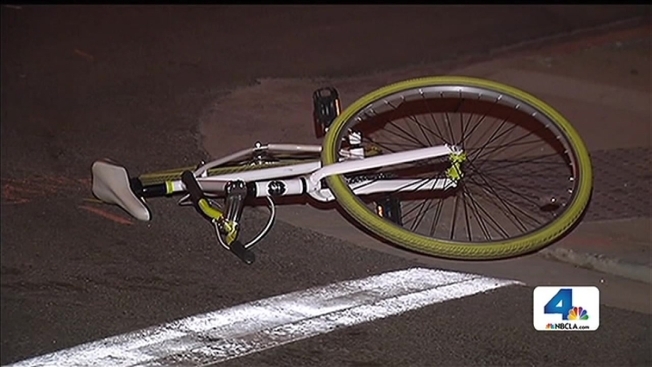 A teenage bicyclist was in critical condition Thanksgiving night after a hit-and-run driver struck him in Long Beach, authorities said. The crash was reported shortly before 5 p.m. near 61st Street and Linden Avenue (map), according to a spokesperson for the Long Beach Fire Department. A 15-year-old boy was riding his bike west on 61st Street when he rode through a stop sign and was struck by a light-colored sedan, possibly a Nissan Altima, traveling north on Linden Avenue, authorities said. Police said the teen did not stop at the sign and was not wearing a helmet or protective gear when he was hit. A witness said the boy looked as though he broke his leg and wrist, and was bleeding from the mouth. 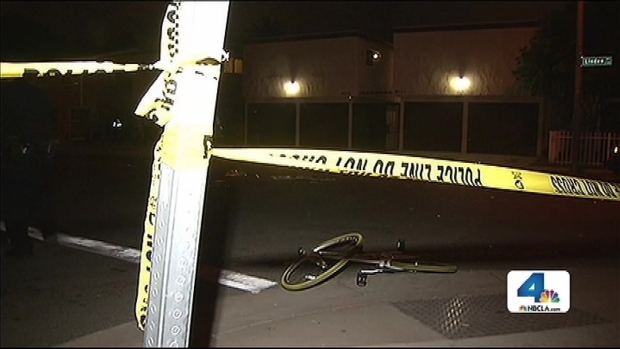 The driver of a light-colored sedan struck a teenage boy riding his bicycle in Long Beach Thanksgiving evening, leaving the 15-year-old in critical condition. Jane Yamamoto reports from Long Beach for the NBC4 News at 9 p.m. on Nov. 28, 2013. The victim was taken to a hospital and listed in critical condition. Investigators are searching for a silver or light-colored compact car with right front-end damage. Residents said the crash happened on a notoriously dangerous street, with children often playing outside and cars constantly speeding. A neighbor, Stephanie Lopez, told NBC4 she's been complaining about it for years, asking the city to install speed bumps or another stop sign farther down the road to slow down drivers. Police said they are aware of the problem. "It is an area of concern to us for the speeding vehicles," said Sgt. Rico Fernandez, with the Long Beach Police Department. Anyone with information in the case is urged to call the Long Beach Police Department's Investigation Detail at 562-570-7355.